We’d love your help. Let us know what’s wrong with this preview of The Sound of Emeralds by Rachelle Rea Cobb. With the help of an old friend with uncertain loyalties, Dirk inches ever closer to clearing his name. Gwyneth throws her faith into good tidings and the promise of a future as a family. But an old evil comes to call, just as t What once was blazing hatred has turned to lasting love, but could the union of a wild heart with that of a lady ever result in more than heartache? To ask other readers questions about The Sound of Emeralds, please sign up. I really enjoyed the conclusion to the Steadfast Love series. We've come so far with these characters, and they're in more emotional turmoil than ever now. In many ways this book is my favorite of the three; both Dirk and Gwyneth have to find out the true meaning of functional love on a day-to-day basis, while standing together in the effort to clear his name for good. At last they come face to face with the vengeful Talan and must face his accusations as well. Very good story! I was given an eARC of THE SOUND OF EMERALDS by Rachelle Rea. Thank you, Rachelle! I have to say, I was a bit disappointed with this one. I didn’t hate it, but it wasn’t for me either. Unfortunately, I can’t address the entirety of my opinion because most of my issues are centered around major spoilers, but I will try my best. (Also, if you haven’t read the first two books in this trilogy, maybe don’t read this review, as it will contain spoilers for THE SOUND OF DIAMONDS and THE SOUND OF SILVER I was given an eARC of THE SOUND OF EMERALDS by Rachelle Rea. Thank you, Rachelle! The Central Plot. Coming into the book, I was expecting the central plot to revolve around clearing Dirk’s name, as had been set up as a necessity in THE SOUND OF SILVER. I was excited to see where that would go. We have tension between Anders, Dirk, and Gwen and, at least at the ending of the previous book, it seems unclear whether Anders will help the two lovebirds or if he will do his best to put Dirk in jail. Unfortunately, I was wrong. Dirk’s legal issues take back burner for most of the novel, and the plot that takes its place just wasn’t for me. I’m sure it would appeal to a lot of other people, specifically people who like children. Weddings do not guarantee a happily ever after. Gwyn and Dirk are married but continue to struggle through their relationship. Dirk has hidden things from his bride and Gwyn has much grief to overcome. Hanging over it all is mission to clear Dirk’s name – and the severe consequences of failure. Will Dirk and Gwyn ever find the peace and love they seek? The Sound of Emeralds is the third and final book in The Steadfast Love Series by Rachelle Rea. It is definitely not a standalone novel but detai Weddings do not guarantee a happily ever after. Gwyn and Dirk are married but continue to struggle through their relationship. Dirk has hidden things from his bride and Gwyn has much grief to overcome. Hanging over it all is mission to clear Dirk’s name – and the severe consequences of failure. Will Dirk and Gwyn ever find the peace and love they seek? The Sound of Emeralds is the third and final book in The Steadfast Love Series by Rachelle Rea. It is definitely not a standalone novel but details the continued struggle and romance of the characters from the first two novels in the series. Emeralds is well-written and beautiful, presenting the hope and peace of God even through pain paired with a sweet romance. The first word that comes to mind when I think back on Emeralds is “frustrating.” A book is sometimes said to be great if it evokes emotion in the reader. This one certainly did – sadness, anger, and frustration. I thought, “The characters have already gone through so much. And now you had to add This!? !” But as frustrating as it was at times, I still consider Emeralds a really good book due to its presentation and ultimately joyous ending. The characters were deep, defined, and dynamic and the setting was extremely well-researched. Part of the ending seemed a little far-fetched, but it fit with the time-period and setting and was crucial to the happily-ever-after. Perhaps it was the extremely-low odds of success that made the joy of the conclusion all the more joyous. The Sound of Emeralds was lovely and I would recommend it to those who enjoy a clean, Christian, historical romance. 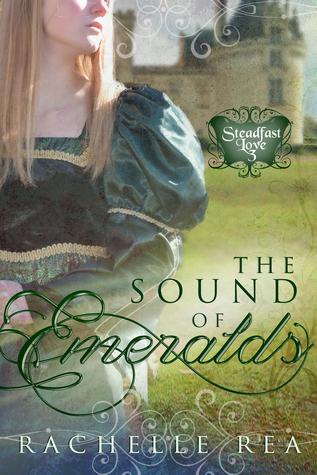 The Sound of Emeralds is an excellent conclusion to the Steadfast Love series. The author packed so much emotion into this book! I have enjoyed the whole series, and the roller coaster ride that The Sound of Emeralds took me on made for thoroughly enjoyable reading. Dirk and Gwyn are characters I grew to love in books one and two, so I found myself fully invested in their victories, excitement, and especially their heartache. While I found myself frustrated with Gwyn in certain parts of the book The Sound of Emeralds is an excellent conclusion to the Steadfast Love series. The author packed so much emotion into this book! I have enjoyed the whole series, and the roller coaster ride that The Sound of Emeralds took me on made for thoroughly enjoyable reading. Dirk and Gwyn are characters I grew to love in books one and two, so I found myself fully invested in their victories, excitement, and especially their heartache. While I found myself frustrated with Gwyn in certain parts of the book and wanting to tell her to just communicate what was in her heart with her husband, I also realized that these two newlyweds still had a lot of growing to do in their marriage, which was only a few months old. It was painful to see them at times struggle to relate to one another. There is a lot packed into The Sound of Emeralds: the blush of new love and the happiness of these newlyweds, the threat of danger that only Dirk knows is coming, sadness that is all-encompassing, and a name that still needs clearing for a murder that Dirk did not commit. I really enjoyed this story from start to finish and recommend the entire series. This was the ending to a series I started reading years ago before it was published. Its been quite an adventure seeing the first book change, and then watching the characters grow over the series. This book was sad. But it was also super sweet, and you got to see the characters in a whole new light. I really loved the ending, because it left you satisfied and happy without making it sound like the characters life's end there. This was everything a final book should be: riveting and resolved by the end, but in no way predictable. If you're a fan of historical fiction, romance, adventure, or the Reformation Era, I highly recommend this series! Rachelle's writing in one word: LYRICAL. From the setting to the characters' descriptions, to conversations and thoughts, her writing once again pulled me in from the beginning. The theme of each book is incorporated in the title in a manner I have not quite come across before (and This was everything a final book should be: riveting and resolved by the end, but in no way predictable. If you're a fan of historical fiction, romance, adventure, or the Reformation Era, I highly recommend this series! The theme of each book is incorporated in the title in a manner I have not quite come across before (and which I thought was really neat). The references to a gem or metal in the title (diamond, silver, emerald) and meaning behind each reference are revealed through reading the story. In other words, each title is not just a pleasant name, but carries deep significance to the story within the pages. Again, Rachelle explores emotions through the relationships in this story. It's a story of friendship and its strength. It's a story of grief and its lasting ripple effects in the present. It's a story of romantic love and its trust and commitment. Ultimately, it's a story of the pure love of God and HIS role as sustainer and source of strength. ohhhh my goodness my heart. the whole book broke it but yet the end fixed it kind of and I don't really understand what my feelings are doing. amazing amazing book. “What once was blazing hatred has turned to lasting love, but could the union of a wild heart with that of a lady ever result in more than heartache? *Note: A mention of someone having devils on their back; A mention of the devil’s scheming. Negative Content- Minor cussing including: two ‘blast’s, two ‘stupid’s and six forms of ‘idiot’; Eye rolling; Fighting, punches, blood, a carnage, swords & battles (up to semi-detailed); Being slapped & pain (up to semi-detailed); Prisons, chains & a trial; Nightmares; Gwyn drinks wine to ease a pain & at one point thinks she needs it; Many, many mentions of murders, murderers, killing, confessions, bodies, blood, a slit throat, crimes, revenge & a dagger (up to semi-detailed); Mentions of a raid, a fire & screams (Book #1); Mentions of a mob & screams; Mentions of hanging, nooses, executions & death sentences; Mentions of prisons, prisoners, chains, & trials; Mentions of bruises, injuries, blood & the smell (up to semi-detailed); Mentions of fighting, fists, injuries, wounds & blood; Mentions of deaths, a plague & fevers; Mentions of nightmares of people dying or being hurt; Mentions of threats; Mentions of drinking & drinking wine; Mentions of alcohol & taverns; Mentions of gambling, brawls, drinking & drunks; Mentions of when Gwyn got drunk by wine (Book #2); Mentions of betrayals & lies; Mentions of rumors, gossip, lies & lying; Mentions of jealousy & hatred; Mentions of throwing up; A couple mentions of someone breaking another’s arm. *Note: *Spoiler* Gwyn loses the baby (blood, mourning & the feelings of it all, up to semi-detailed) *End of Spoiler*; Mentions of women’s monthly course & pain; Mentions of modesty & just wearing a nightgown; A few mentions of a wet nurse; A mention of a man’s bare back. I still truly adore Gwyn, if y’all couldn’t tell from my previous reviews of the previous books (#1 & #2). Speaking of the previous books, I again was so happy with all the faith content and was also so happy that a book with a married couple was so clean! No hints of any marital acts or anything, so an A+ to the author! Truly, none of those kisses were too much, as it was more of a peck here and a peck there. Super sweet! After the turmoil that brought them together and an emotional betrothal, Lady Gwyneth and Lord Dirk Godfrey are now married. The two are deliriously happy as they begin their new life among family and friends at Godfrey Estate. Yet not everyone is full of joy for the happy new couple, and Gwyn’s old friend Anders continues to linger. Dirk continues to try and clear his name of crimes he didn’t commit, though it is a struggle. When Gwyn and Dirk receive some good news, their minds are preoccupied with their happiness. Yet when tragedy strikes, they fear it could be the end of this romance that was seemingly doomed from the start. What a ride this series has been! From Gwyn hating Dirk in the beginning, to now not being able to fathom life without him, Dirk’s undying devotion to Gwyn all the while, we’ve seen a lot happen. And The Sound of Emeralds offers no lack of twists and turns. As the book begins, Gwyn and Dirk are so happy, yet toward the middle, we see them struggle over their loss. I felt bad for them and all they had to deal with, on top of Dirk trying to clear his name. It was tough! But after a time, both came to lean on the Lord and slowly started to heal. Things were not perfect, as few things in this world ever are, yet in the end, Dirk and Gwyn got their happily ever after. This series has been a realistic one. I’ll admit, one could be skeptical to find that Gwyn and Dirk have fallen in love so quickly in the face of what they’ve been through, though stranger things have certainly happened. But things have never been easy for them, though they have grown up in pampered families. They’ve faced more than their fair share of hardship, but with the Lord’s help have pulled through. Another thing I like about this series is the covers. I think all of the covers for the Steadfast Love series are pretty, but I think this one is my favorite. It just makes you feel like you could step into the 16th century and I love Gwyn’s gown. All in all, The Sound of Emeralds was a great conclusion to a charming series that I’d recommend to any fan of historical romance. I'm a little teary-eyed in my heart while writing this review -- for the final installment of the best historical romance series on the market. To recap (in my own words), "Diamonds" (book 1) was the treacherous adventure. "Silver" (book 2) brimmed over with true hope and sincerity. "Emeralds" (book 3) is... the unthinkable. From "blazing hatred" to "lasting love" is exactly how Gwyn and Dirk's relationship has twisted and then sprouted. But even for them, it's still a rocky road to maintain a ma I'm a little teary-eyed in my heart while writing this review -- for the final installment of the best historical romance series on the market. To recap (in my own words), "Diamonds" (book 1) was the treacherous adventure. "Silver" (book 2) brimmed over with true hope and sincerity. "Emeralds" (book 3) is... the unthinkable. From "blazing hatred" to "lasting love" is exactly how Gwyn and Dirk's relationship has twisted and then sprouted. But even for them, it's still a rocky road to maintain a marriage filled with steadfast love. Set in England during the mid-1500s, this series breaks ground on my own bookshelf, for sure; honestly, I just haven't read much fiction that takes place in this time period. For me, it created an all-new reader experience which I enjoyed being in. Many authentic features are drawn into these books, such as the religious issues (Catholicism and Protestantism), social statuses, crime and punishment of the time, and much more. "Emeralds" goes deeper and into a much darker place than what I had yet seen in Rea's previous two books... and it was thrilling! How did she hold out this long on us readers before bringing in these unfathomable emotions... and heartbreak? I don't want to give away the plot, as I want you to be as taken by surprise as I was... but "Emeralds" will definitely be an emotional read for anyone. I've had the honor to know Rachelle personally and to watch this series bloom from the first book to this final chapter. By the end of the book, they have trudged through gut-wrenching heartache, betrayal and darkness that n I've had the honor to know Rachelle personally and to watch this series bloom from the first book to this final chapter. By the end of the book, they have trudged through gut-wrenching heartache, betrayal and darkness that nearly snuffed out the light in Gwyn's eyes. Yet, they survived. Together, they learned to have hope as unbreakable as diamonds...trust and faith as unbending as silver...and love as steadfast and vivid as emeralds. When I finally reached the last page of their story, I found myself content. Content that they had reached an ending that may not have been easy, but was beautiful. Content that no matter where they were taken next, they would cling tightly to each other, and to the God who's love never fails. May we all be encouraged by the same hope, faith and love that sing more beautifully than any glistening jewel. One mark of a special story and storyteller is when the reader is reluctant to finish the book, the last book in the series(?!) because they've been through so much with the characters. And The End means goodbye. And so, it is with a bittersweet heart I attempt to share a spoiler-free review of The Sound of Emeralds by my friend Rachelle. What I love about the series on the whole is that each book picks up almost immediately when the last book left off, and such is the case with this last tale of One mark of a special story and storyteller is when the reader is reluctant to finish the book, the last book in the series(?!) because they've been through so much with the characters. And The End means goodbye. What I love about the series on the whole is that each book picks up almost immediately when the last book left off, and such is the case with this last tale of Gwyn and Dirk's. Incandescently happily married, worry and danger knock on their door with the arrival of a new day--the day after they are married. Gwyn's pursuit to clear Dirk's name is still going strong as it had begun in The Sound of Silver, and it is for this reason and a larger, more fearsome threat than a trial in London, that makes this book as much of a page-turner as its predecessors. Rachelle expertly weaves in the history of the era so you are completely immersed in the vibrant setting and you also, without realizing it, learn more about how things were done back in the 1500's. For better or for worse, in sickness and in health--Gwyn and Dirk's marriage vows are tested at every turn as the story goes on as they face grievous loss, are called to risk their very lives and love in pursuit of truth and justice. All I can say is, it is a wonder to watch these characters grow and change both separately, and together in this final book in The Steadfast Love trilogy. All good things must come to an end. If that saying is true, it applies tenfold to the Steadfast Love series which has been an unforgettable saga! And so The Sound of Emeralds brings me to the end of my adventure and journey with these beloved characters that Rachelle Rea has so masterfully crafted. I was first introduced to Gwyn and Dirk last summer and have loved them more with each book in this epic trilogy! While reading this book I was being pulled by two emotions: on the one hand I wanted t All good things must come to an end. If that saying is true, it applies tenfold to the Steadfast Love series which has been an unforgettable saga! And so The Sound of Emeralds brings me to the end of my adventure and journey with these beloved characters that Rachelle Rea has so masterfully crafted. I was first introduced to Gwyn and Dirk last summer and have loved them more with each book in this epic trilogy! While reading this book I was being pulled by two emotions: on the one hand I wanted to know how the series would conclude. Would they get their happy ending? On the other hand, I tried so hard to read each page slowly because I just didn’t want the book to end! What I love about this book and well, the whole series really, is the deep faith that the characters have in God. Deep faith doesn’t always mean that it is unwavering or that it never doubts. I think what matters is that you always come back to the Lord even if you do wander for a short while. I loved that I got to see that faith and hope in Rachelle Rea’s writing. I’m sad to be reaching the end of this series, but I can always go back and re-read it! Now if you’ll excuse me I think I’ll go bury my nose in the pages of The Sound of Diamonds. The Sound of Emeralds was a beautiful conclusion to a series I won’t easily forget. I’ve loved both Gwyn and Dirk from the start and watching their relationship with each other – and with the Lord – unfold was inspiring and lovely. I felt as if I had traveled their journey with them. And I’m a little sad to say goodbye. Once again, the setting is very strong and unique. At first, I struggled a bit getting into the book. I wondered what could be left of their story to tell, but as the pages turned The Sound of Emeralds was a beautiful conclusion to a series I won’t easily forget. I’ve loved both Gwyn and Dirk from the start and watching their relationship with each other – and with the Lord – unfold was inspiring and lovely. I felt as if I had traveled their journey with them. And I’m a little sad to say goodbye. Once again, the setting is very strong and unique. At first, I struggled a bit getting into the book. I wondered what could be left of their story to tell, but as the pages turned, the story drew me in more and more. The tension was great and the romance easily melted my heart. This book was an amazing ending to the series! It had me both on edge and in awe of the historical detail and the amazing love Dirk and Gwyn has for each other. Through heartache, death, and trials, their love staid true and strong. What a great book! Plot was better than the second one in this book. The character arcs were quite on point, and the detail was exquisite. I’m so sad I’ve already finished the series, but I can’t wait to see what Rachelle has next. Thank you Rachelle for such an amaz This book was an amazing ending to the series! It had me both on edge and in awe of the historical detail and the amazing love Dirk and Gwyn has for each other. Through heartache, death, and trials, their love staid true and strong. What a great book! The third book is the conclusion in the lovely, emotional, beautiful series of Steadfast Love. This book rounds out the characters we've read about in the first two books and deal with good and bad emotions. There is sadness, grief, anxiety, depression, bitterness, hatred, joy, and peace. It is very realistic in these emotions. I love the way heal of the bad emotions was brought about, and I highly recommend all three books. I was given a copy for an honest review. This is the book that hooked me on the series! My favorite of the series. Interesting historically and far more emotional depth and breadth. A lovely, emotional conclusion to a beautiful series! Ever since I finished The Sound of Silver I have eagerly anticipated The Sound of Emeralds. And I was not disappointed! The end of Silver left us with glad tidings, yet a shadow to be resolved. Namely, proving Dirk's innocence. I just LOVED how this book touched on real life feelings and struggles. Emeralds rounds out the stories of the characters we've come to love so dearly. This book deals with a lot of emotion, both the good and what could A lovely, emotional conclusion to a beautiful series! Emeralds rounds out the stories of the characters we've come to love so dearly. This book deals with a lot of emotion, both the good and what could be classified as "bad." I loved how Ms. Rea handled the "bad" emotions, such as the sadness and the depression, the grief and the anxiety. It made the characters raw, vulnerable, and realistic. But I also particularly appreciated how she handled the healing that came after; both the joy and the peace. Over the course of these three novels, Ms. Rea tells a beautiful story. I loved watching Gwyn, Dirk, and even the minor characters grow through these novels. This book had me gripping my e-reader, desperately needing to know how things would be resolved. So while Diamonds (I think. It's hard to choose!) remains my favorite of the series, Emeralds definitely gave it a run for its money! If you like historical novels, you must not miss this one!! Rachelle Rea's conclusion to her Steadfast Love series, The Sound of Emeralds, left me with a feeling of great satisfaction. Throughout this series, Rea has delighted me with her twisting plot lines, message of faith, and complex characters. Each book added depth to these characters as I was invited into their lives, witnessing struggles, hopes, heartbreaks, and profound lessons. After three books, these characters became my friends, and their lives challenged me in unexpected ways. Rea is a rem Rachelle Rea's conclusion to her Steadfast Love series, The Sound of Emeralds, left me with a feeling of great satisfaction. Throughout this series, Rea has delighted me with her twisting plot lines, message of faith, and complex characters. Each book added depth to these characters as I was invited into their lives, witnessing struggles, hopes, heartbreaks, and profound lessons. After three books, these characters became my friends, and their lives challenged me in unexpected ways. Rea is a remarkable storyteller. Her ability to weave an intriguing plot and characters has kept me going for this entire series. I especially enjoyed delving into this historical period and appreciate her research into the era. Rea truly made history come to life, complete with both its harshness and beauty. I hate to say farewell to this series. However the ending was full of promise, which dulls the goodbye. I'm looking forward to seeing what Rea has next in store! The Sound of Emeralds is the third book and the conclusion of Steadfast Love series. I really enjoyed this one and I found that it was my favorite. The story picks up where book two left off. You will read about the characters from the other two books . There is a lot of good and bad emotions in The Sound Of Emeralds. Will Dirk ever prove his innocents? What will happen to Gwyneth and Dirk? Will they ever get to be together or will they be separated forever? The author has did a fantastic job on this series . I have loved them all. But Rachelle Rachelle Rea Cobb has history with words. She penned her first short story in middle school, her first novel right out of high school, and signed a three-book publishing contract right after college. Her Steadfast Love series (from WhiteFire Publishing) is the tale of a Catholic maiden entrenched in the Dutch Revolution–and the redheaded Protestant man who brings her to love and faith. She lives in a seaside Southern town with her new husband, who shares the name of Rachelle’s first fictional hero—even though she hadn’t yet met her husband when she wrote three books about a man with the same first name! She drives a pick-up truck and is addicted to all the different kinds of Oreos.